The two most used operating system in the world are the windows and the android. And how would it be if there is a release to have them both together on a PC simultaneously and one could use them at the same time without switching?? This year at CES , many people got just the thing they were looking for. 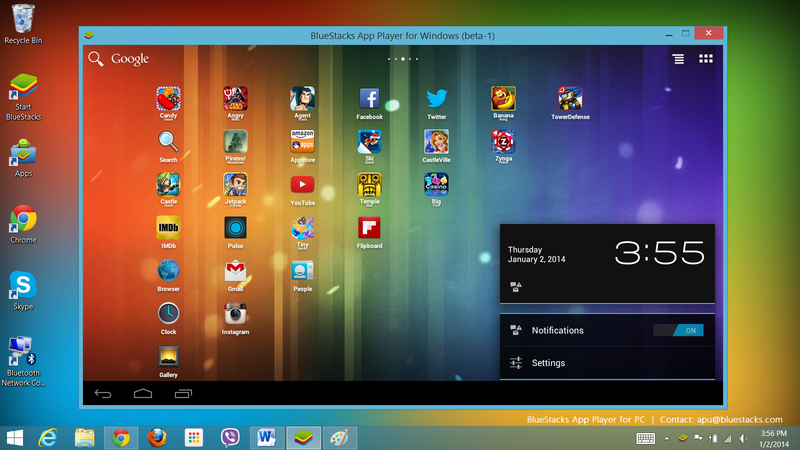 The company BlueStacks in collaboration with AMD have created the android for windows 8. It runs on top of windows and they have taken care of the very last details while creating it. I have tried emulators, tried running android on VMs but it was still painfully slow. But with this release its become awesome. Imagine the apps that are only on android can be played in full resolution. You don’t need your phone/tab while you are home and because the apps will be synced straight into the android running on your PC. And for the best part it even allows you to sync multiple android devices. So this has the potential to bridge the gap between multiple operating systems and multiple devices. This does not involve Dual booting, as it becomes very messy and is very resource intensive. The bluestack-AMD approach is a virtual environment created to run android natively. This is as of now optimized under AMD and thus makes use of the AMD’s APUs, beginning with the 4th generation AMD APU codenamed “Kaveri” . For the user, the workflow advantages are enormous. BlueStacks provides a full Android User Interface (UI). The customization, settings and personalization capabilities you expect from your Android phone or tablet are right there in the virtual Android environment. And that Android UI? It is a fully functional window on your Windows desktop. So, you can have Photoshop open on one side of your desktop and your favorite Android app on the other. About to unlock a Booster? Blow your Android window up to full screen and fill your desktop. BlueStacks takes full advantage of the AMD platform. For those of you having Intel, I think it should be a short wait before something alike comes for Intel as well, because BlueStacks has made it clear why this is very necessary.